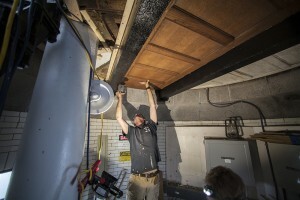 G installs the new 5th floor ceiling, an exact reproduction of the original, surviving parts of which were left in place. Remember the oak ceiling we showed being built on Nantucket back in April? 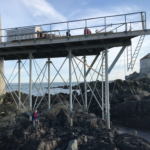 It’s now installed at Graves Light. 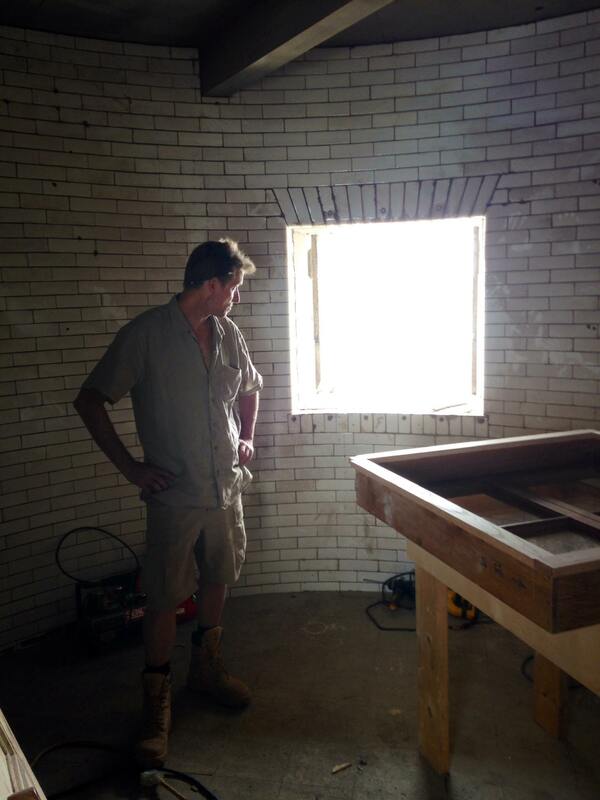 Karl Phillips puts the new oak ceiling panels in place. 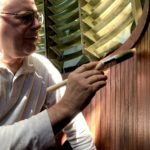 Master carpenter Karl Phillips built perfect replicas at his Driftwood Construction shop, based on surviving original panels and the original architectural drawings. Karl and G put the new oak panels in place up on the 5th floor library of the lighthouse. G is performing the trimming and shaping. Karl did most of the other woodwork at Graves, too, including reconstructed oak windows based on the original casement design, interior oak window panels and sills, interior oak doors, and the mahogany staircase handrails. As we’d previously noted, we decided to leave the original damaged ceiling panels in place, covering them with the new ones to give some future renovators a surprise. 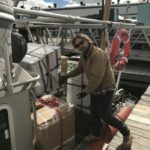 A busy springtime week at Graves Light. Karl Phillips, our master carpenter, puts the finishing touches on the new oak window sills and paneled surrounds that he made over the winter at his Nantucket workshop. 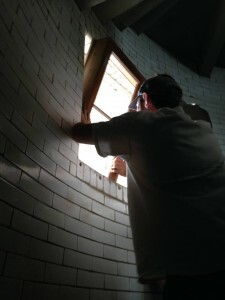 There are nine of these square windows at Graves Light. 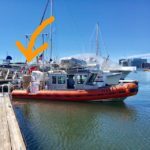 Last year, Karl built exact reproductions of the original casement windows, installing them in time for winter to replace the un-authentic glass block that the Coast Guard had installed for easy maintenance once the original windows deteriorated. 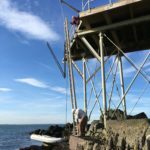 Meanwhile, Mike and Brian Sylvester of CCI, who cleaned and pointed the outside of the tower last season, are now inside the lighthouse. They’re removing the rust that was eating away at the steel floor joists. As the joists rusted, the expanding iron crushed and split the interior wall, breaking up the curved glazed bricks. About five of the joists need to be excavated from the walls, cleaned and painted, and the brick space around them re-tiled. The “tiles” are actually glazed bricks. 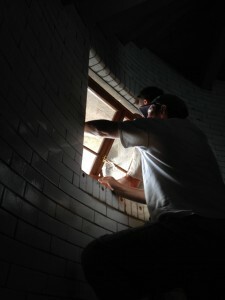 To do the re-tiling, we’re going to steal some curved glazed bricks from under the stairs, to keep the walls original. We’re getting wicked excited about a winter project that’s entering its final stages. 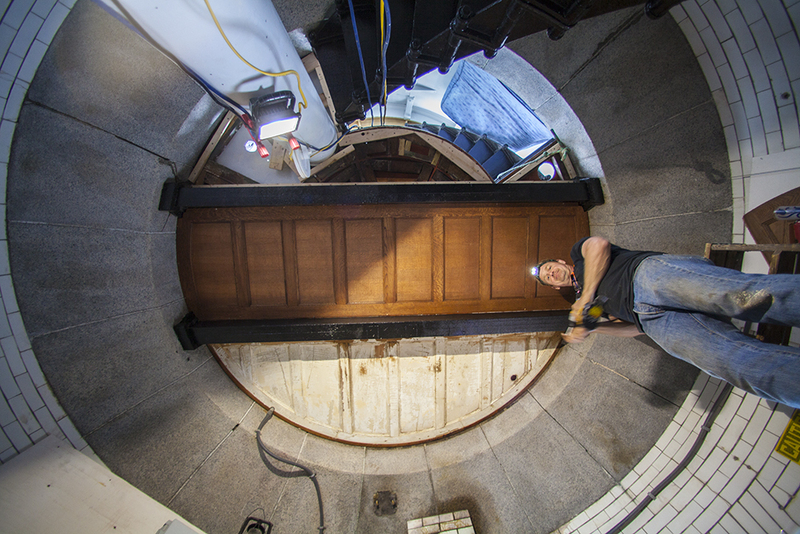 The oak ceiling of the Graves Light living quarters are being reconstructed, just as it would have looked in 1905. 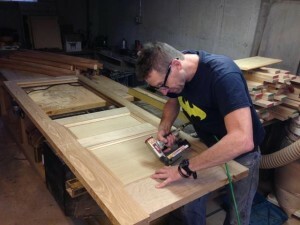 Down on Nantucket, Driftwood Construction’s own Karl Phillips is working day and night, this time building the amazing paneled oak ceiling for the 5th floor study. 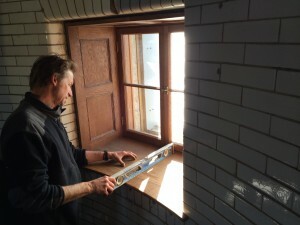 Karl already built perfect oak copies of the original casement windows, window sills, window paneling, and interior stairway doors. 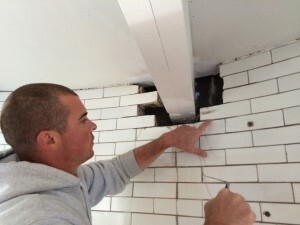 He’s been using the original 1903 architectural drawings to rebuild the ceiling. 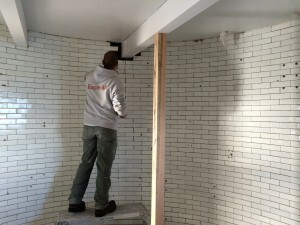 But since parts of the original ceiling are still in place (despite their heavy damage), Karl was able to take measurements right off the original. For the fun of future generations, we think we’ll install this new ceiling to cover the original old one, so that in another 100 years, people will have something to discover. Take a look at the pictures of Karl’s latest work. 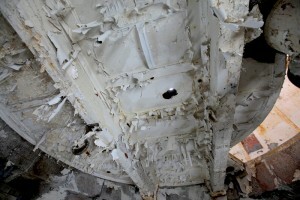 This is what we found of the original ceiling before we began renovation. This is the original 1903 US Light House Service architectural drawing for the oak ceiling. 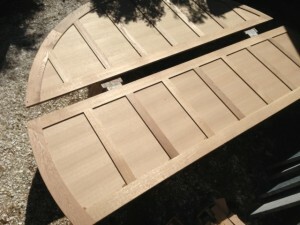 Wide interior oak panels for the reconstructed casement windows, made by Karl Phillips of Nantucket. 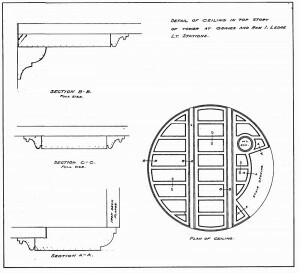 Karl copied them from the original 1903 Graves Light architectural drawings. 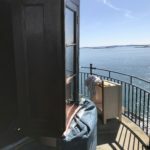 Seven-foot thick granite walls make for some deep windowsills, and our man Karl Phillips is making up beautiful trim to complement, in his workshop in Nantucket. 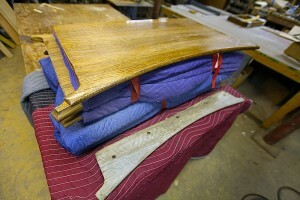 These are the side and top panels for the window wells, based off the original native white oak interior built at the U.S. Lighthouse Establishment wood shop in Portland, Maine. The originals are gone, so we used the 1903 architectural drawings to make copies. 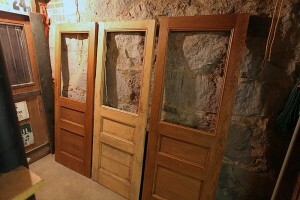 Karl also made reproductions of the original interior doors this winter. 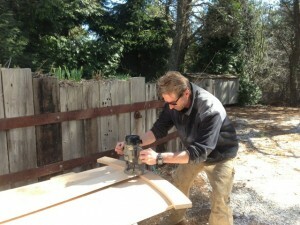 Last summer, he built exact copies of the original oak casement windows, among other work. Making exact copies of the interior doors of Graves Light at Karl Phillips’ Nantucket shop. The snow and ice haven’t stopped the renovation of Graves Light. We’ve been using the winter months to reconstruct precise reproductions of the original interior woodwork. 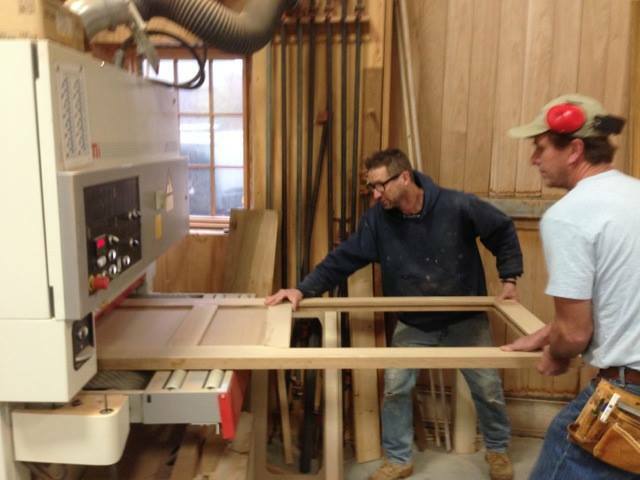 Lots going on at the Nantucket workshop of Master Carpenter Karl Phillips. 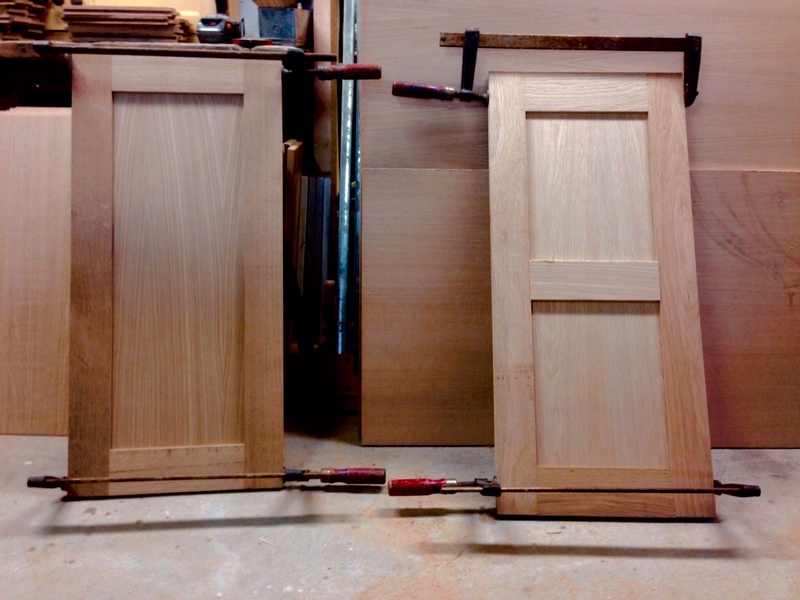 Karl has finished replicating the interior stairway oak doors, and the deep oak sills of the windows that he built last summer. 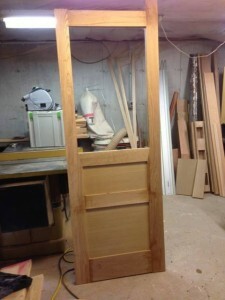 One photo shows the sole surviving original interior door, rebuilt and stripped down to the wood, flanked by two reproductions to be installed in the spring. The original door itself needed major repairs, but it provided us a good template to work from. 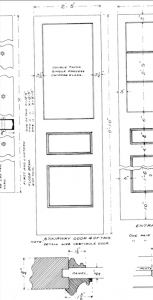 Original 1903 US Light House Service architectural drawings of the doors helped ensure faithful reproductions. Karl also built nine new oak windowsills using one rotted original sill (in the foreground of the gallery picture below) as a guide. 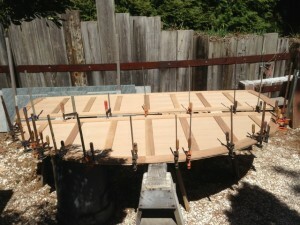 Just wait until he installs these with his oak paneling – still under construction – to fill in the deep window pockets! 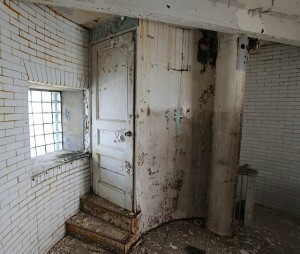 The original interior stairway door is shown, still on its hinges and covered with a century’s worth of paint, before sandblasting and re-painting began in 2014. The new oak window sills that master carpenter Karl Phillips built at his Nantucket shop in early 2015. A fragment of an original sill, used as a template, sits at the foreground. 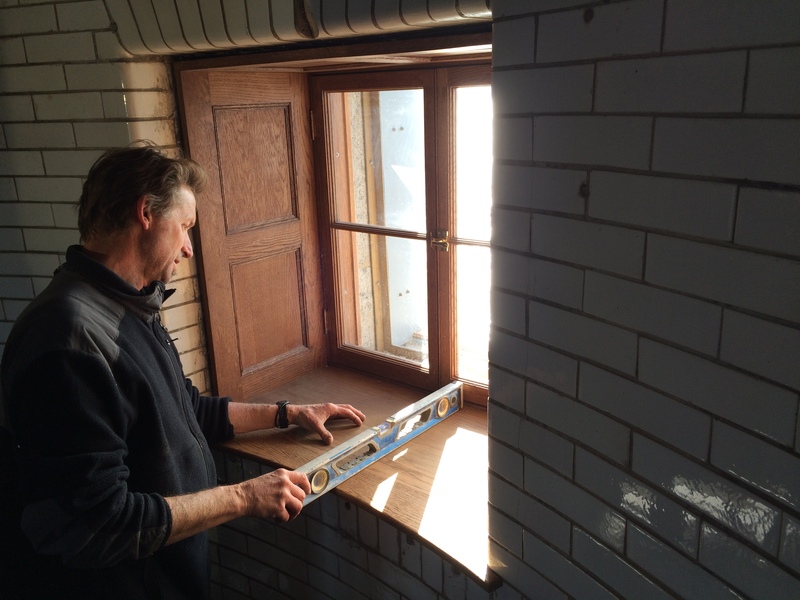 Karl Phillips of Driftwood Construction in Nantucket looks at how he’s going to install the white oak casement window he built to restore the Graves Light windows to their original appearance and function. From a rotted original casement window frame, master carpenter Karl Phillips and his friend Will Phelps built nine replacements in his Nantucket workshop, and installed them at Graves Light in early August 2014. 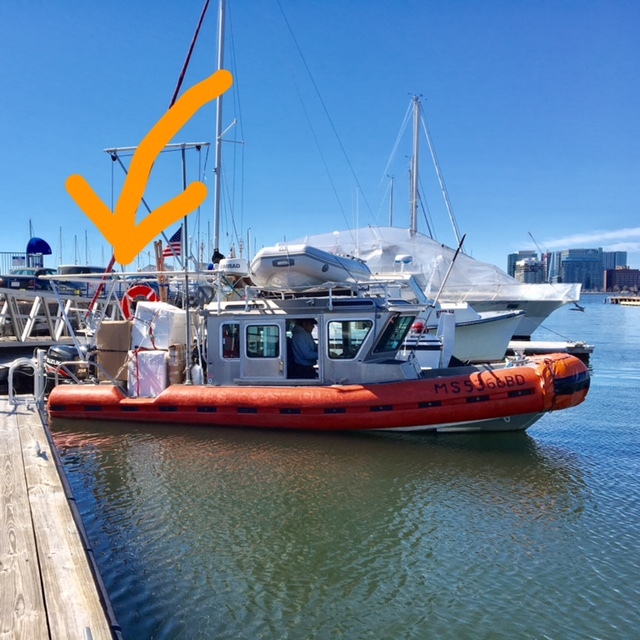 First we removed the historically inaccurate and aesthetically displeasing block glass windows that the Coast Guard installed decades ago to replace the originals, and then installed the casements. 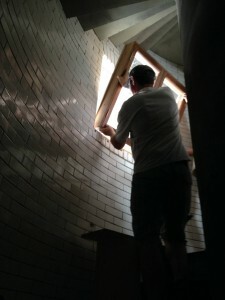 Karl and fellow carpenter Will Phelps lift the white oak casement window in place. The oak casement is an authentic return to the original window appearance and function, replacing unsightly and historically inaccurate mid-20th century glass blocks. Fitting the window is a time-consuming task, as the granite stone contains curves to protect against water seepage, and the oak frame must be trimmed with precision.